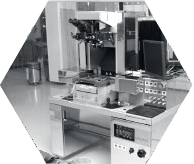 The Raith 150 Two is a high resolution low voltage electron lithography (EBL) and metrology system. It is suitable for research and development of MEMS, micro and nanoelectronic, plasmonic, photonic systems and integrated optical devices. A scanning electron microscope equipped with laser interferometry stage capable of working with samples up to 50x50 mm2. Overlay and stitching accuracy below 100 nm, linewidth below 20 nm. The DWL 66FS laser lithography system is a high resolution pattern generator for low volume mask making and direct writing. The capabilities and flexibility of this system allows the use of this research tool in MEMS, BioMEMS, Micro Optics, ASICs, Micro Fluidics, Sensors, CGHs, and all other applications that require microstructures. The Süss MicroTec MA8 is a standard UV lithography tool for exposing wafers through mask. Exposure can be carried out in proximity mode or in contact mode. The MA8 is equipped with top side optical microscopes and bottom side microscopes, so alignment is possible from both sides of the wafer. The RCD8 coat and develop platform is equipped with a basic manual spin coater and a GYRSET® enhanced coater and puddle developer tool. It can handle small pieces as well as standard wafers up to 200 mm and therefore is ideal for daily R&D work up to small scale production. The wetbench provides a complete basic setup for substrate coating. It consists of the built-in spin-coater LabSpin 6 for manual resist dispense, two hot plate modules HP8, and one vapour primer VP8 for HMDS coating (adhesion promoter). The Dektak stylus surface profiler is an advanced thin and thick film step height measurement tool. In addition to profiling surface topography and waviness, the Dektak system measures roughness in the nanometer range. The Diener NANO Plasma Cleaner with microwave generator can be used for resist stripping. Microwave plasma is ideal for most resist removal in modern device fabrication. Critical point drying (CPD) is well established method for wafer and MEMS drying. It reduces the effects of deformation and shrinkage that occur when drying wet samples by conventional evaporation. Multilayers characterization, resist thickness measurement mainly. Interval of measure film thickness from 10 nm up to 100 µm. Microscope Zeiss Axio Imager A2 for control of lithography processes in reflected-light, bright field and dark field. Equipped with PC interface. Deep reactive-ion etching (DRIE) is a highly anisotropic etch process used to create deep penetration, steep-sided holes and trenches in wafers/substrates, typically with high aspect ratios. The Experimental plasma enhanced CVD reactor is constructed for diagnostics of plasmachemical processes in capacitively coupled radio frequency (RF) discharges (13.56 MHz). It is possible to measure a delivered RF power, investigate presence of plasma-excited species by optical emission spectroscopy, obtain information about energy and flux of ions impinging on the substrate RF electrode, and measure mass and ion energy spectra of plasma phase particles. Chemical vapour deposition system reaching very high deposition temperatures dedicated to the deposition of carbon nanomaterials, possibilities of plasma enhancement by discharges of different frequency (including their regular switching). The physical vapor deposition method allows thin films to be etched by the use of broad beams of positively charged ions in a high vacuum system. The system is equipped with SIMS spectrometer for precise end-point detection. The system consists of a sputter deposition chamber with 8 magnetrons in sputter up configuration. The lid flange of the sputtering chamber is sealed with double viton O-rings and differentially pumped. The heating sources for the XREACT radiation furnaces are halogen lamps or short arc lamps. Heating rates up to 150 k/s are possible. In our Rapid Thermal Processing (RTP) systems wafers can be annealed. As components of testing machines, the radiation furnaces are very small and are especially used for thermo mechanic fatigue (TMF) tests. Plasma enhanced chemical vapor deposition is a method for the creation of thin films with thicknesses of few tens of nanometers up to several micrometers. It belongs to CVD techniques that utilize reactants in the form of gases and vapors. System for deposition of thin layers of metal oxides on a horizontally oriented wafer/sample inside a cylindric steel reactor, with higher growth speed and lower control of layer thickness than a related ALD technique. System for a precisely controlled growth of oxides on silicon wafers in horizontal quartz tubes with soft-loading placement of boats holding up to 50 wafers in one run. This position within the LPCVD system is dedicated to growth of amorphous silicon on Si wafers, using silane (SiH4) as a precursor in LPCVD process. This position within the LPCVD system is dedicated to growth of silicon nitrides of different stechiometry on Si wafers, using dichlorosilane (SiCl2H2) and ammonia (NH3) as precursors in LPCVD process. Plasma enhanced chemical vapour deposition using chemically reactive plasma for deposition of silicon based materials. Thin film deposition by plasma enhanced chemical vapour deposition. Etching of silicon and metals by reactive ion etching. Reactive-ion etching (RIE) is an etching technology used in microfabrication. RIE is a type of dry etching which has different characteristics than wet etching. RIE uses chemically reactive plasma to remove material deposited on wafers. Thin film deposition by electron beam evaporation. Atomic Layer Deposition is a deposition technique for very thin layers with the thickness control down to a single atomic layer. It belongs to the CVD techniques family. Suitable for Ion-beam sputter deposition, Ion-beam assisted deposition, reactive sputter deposition with nitrogen and in-situ initial/continual substrate (pre-)cleaning. These laser micromachining systems are designed as versatile R&D, process development or pilot production systems. Wire bonding is a micro-welding technique for electrical interconnection of the sample substrate structures and semiconductor chip thin metallic layers. Contact between the sample surface and pure gold, alloyed aluminium or copper wire is provided by three main methods: ultrasonic, thermocompression and thermosonic bonding.